It took me 60 hours to complete Dark Souls 2, so when I heard about this 20 minute Dark Souls 2 speedrun I was very angry. How dare they, I thought. It just isn't fair. Never mind though, because this run utilises a series of glitches allowing the player to skip a pretty huge portion of the game. Oh, and did you know rolling while using the binoculars makes you somehow faster? It does. With a combination of these, YouTube user Distortion2 gets to Aldia's Keep in less than six minutes. It's interesting how Distortion2 uses the seams in the world of Drangleic to his advantage, especially since the game's only been out for a matter of weeks. There's always the possibility From Software will patch these fissures up, but hopefully not before he completes his goal of completing the game in under 20 minutes. 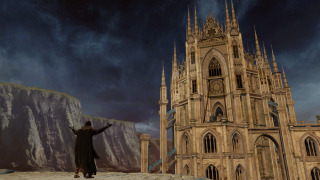 If you missed them earlier, we captured a bunch of pretty 4K resolution screenshots from Dark Souls 2 . You'll probably want to get Durante's mod first, which unofficially enhances the game's performance.